It is known that about 83% of the successful security attacks happen to Small and Medium Businesses (SMBs) rather than large organizations. This is a very frightening fact, considering the number of SMBs existing across the globe. Running a business critical application in SMBs are always a challenge, given the fact that the availability of budget, other resources and the ability to tolerate application downtime is very limited. Let’s try to address these problems and close the holes which will help you run a more secure business and do things you are best at doing. It is more like a paradox if a SMB is caring about security as well as being on the edge of technology. Not every technology helps you secure your organization. It is always advisable to exactly know what technology you are implementing in your organization. Cloud: It is literally considered that if a business is not adopting to the cloud, then the business is outdated. But its a myth. You choose what is necessary for your business and don’t let the technology evangelists influence your decision for your organization. 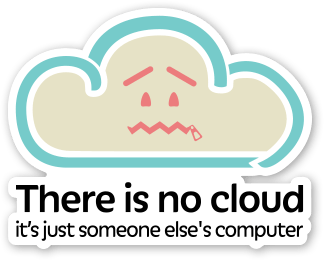 Ultimately, as a popular meme says, Cloud is someone else’s computer. Mobile: One of the biggest factor which gives sleeplessness for IT Admins is mobility. You have no control over what information is floating around in who’s hands. For example, you cannot control an email from being accessed by your team member who is on the move. You never know what could happen when the phone is lost with all the business critical data sitting on the mobile. Mobility could be devastating. Bring Your Own Device Policies: You know very well about it. You are literally permitting anyone in your organization to bring any device of their choice. It will make people happy. But then, your privacy? Not that safe. Again, its someone else’s device. Choose powerful tools that can run on-premise — It is more than important to take control of your data all by yourself. Choose powerful tools that can run on-premise and check if you have the ability to run them with very less overheads. If you need help, please talk to me directly. Protect your data in mobile environments — to make sure all the business critical data stays within your reach. It is essential to constantly implement security policies across wired and wireless networks across the company with mobile configuration policies. Move to products with built-in security — to make sure you build a secure IT foundation from ground-up for your company. Always buy technologies with security built right into it, rather than relying on another resource to secure your systems. Establish multilayer security strategy — and ensure that the framework spans across people, products and technologies in your organization. Train your employees — so that they act as the first line of defense for your company against any cyber-crime activity. There’s nothing like educating the employees to take care of security. Ultimately, your data is your entire business. Don’t compromise your security for cost. Protect your business critical data with the right IT solutions like SHRINK. SHRINK is the best data compression and security server money can buy today. We take security and privacy very seriously. Learn more or contact us today to get a trial.